At the General Assembly of the GOVERNOR and COMPANY of the English Colony of Rhode-Island, and Providence Plantations, in New-England, in America, begun and holden, at Providence, within and for the said Colony, on the last Wednesday in October, in the Year of our Lord, One Thousand, Seven Hundred and Seventy Four, and Fifteenth of the Reign of His Most Sacred Majesty, GEORGE the Third, by the Grace of GOD, King of Great-Britain, and so forth. The Honorable Joseph Wanton, Esq; Governor. The Honorable Darius Sessions, Esq; Deputy-Governor. Mr. Henry Sherburne, Deputy Secretary. 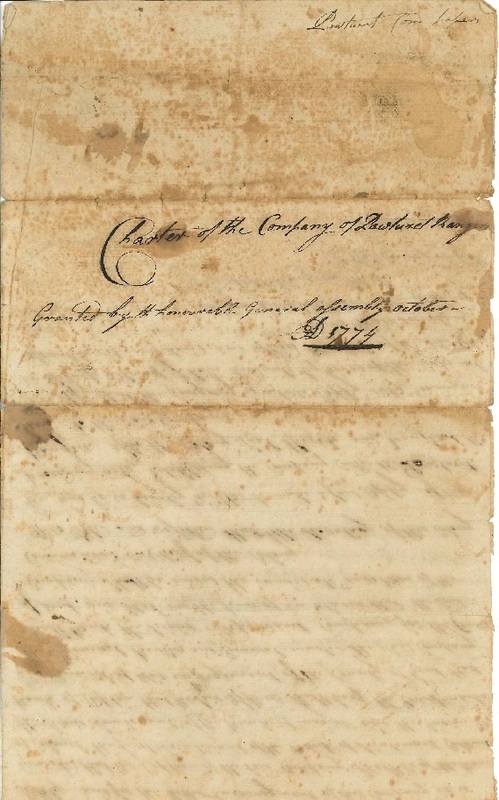 An ACT establishing an Independent Company, by the name of the Pawtuxet Rangers. WHEREFORE, this Assembly, to encourage a Design so laudable, have Ordained, Constituted and Granted, and do hereby Ordain, Constitute and Grant, That the said Petitioners, and such others as shall be added to them (not exceeding One Hundred Men, Rank and File) be, and they are hereby, declared to be an Independent Company, by the Name of the Pawtuxet Rangers; and by that Name shall have perpetual Succession; and shall have and enjoy all the Privileges and Immunities hereinafter granted. IMPRIMIS, It is Granted unto the said Company, that they, or the greater Number of them, shall, and may, once in every Year, to wit: On the Second Wednesday in April, meet and assemble themselves together, in some convenient place, by them directed, then and there to choose their Officers, to wit: One Captain, Two Lieutenants, and One Ensign, and all, other Officers requisite for the training, disciplining, and well ordering the said Company: At which Meeting no Officer shall be chosen but by the greater Number of Votes then present: The Captain, Lieutenants, and Ensign, to be approved of by the Governor and Council, for the Time being; and shall be commissionated and engaged in the same Manner as other military Officers in this Colony are. SECONDLY, That the said Company shall have Liberty to meet and exercise themselves upon such other Days as they shall think proper, and not be subject to the Orders or Directions of the Colonel, or other Field Officers, of the Regiment in whose District they live or shall be, in such Meetings and Exercising: And that they be obliged to meet, for Exercising, at least, Four Times in the Year, upon the Penalty of paying to and for the Use of the said Company, to wit: The Captain, for every Day’s Absence, Three Pounds, lawful money, the Lieutenants and Ensign, each Twenty Shillings, lawful money, the Clerk ad other subaltern Officers, Twelve Shillings, lawful Money, each , and each private Soldier, Six Shillings, lawful Money, to be collected by Warrant of Distress, to be directed to the Clerk, from the Captain, or other Superior Officer, for the Time being. THIRDLY, That the said Company, or the greater Number of them, make such Laws, Rules and Orders among themselves, as they shall deem expedient, for the well ordering and disciplining said Company; and lay any Penalty or Fine, for the Breach of such Rules, not exceeding Twelve Shillings, lawful Money, for One single Offence, to be levied and collected in Manner above-mentioned. FOURTHLY, That all those who shall be duly inlisted in said Company, so long as they shall continue therein, shall be exempted from bearing Arms, or doing other military Duty (Watching and Warding excepted) in the several Companies, or Trained Bands, in whose District they respectively live, excepting such as shall be Officers in said Company or Trained Bands. FIFTHLY, That if any Officer, or Officers, of the said Company, shall be disapproved by the Governor and Council, or shall remove out of the said Towns of Warwick and Cranston, or shall be removed by Death, that then and in such Cases, the Captain of said Company, or other Superior Officer, for the Time being, shall call a Meeting for the election of another, or others, in Manner as aforesaid. SIXTHLY, And, for the better Encouragement of the said Company, It is Granted, That the Captain of the said Company shall be of the rank of Colonel, the First Lieutenant, of the Rank of Lieutenant-Colonel, the Second Lieutenant, of the Rank of Major, and the Ensign, of the Rank of Captain: That the said Officers shall be of the Court-Martial, and Council of War, in the Regiment of the County of Kent: That, upon all general Reviews, and general Musters, the said Company shall rank the Second Independent Company for the County of Kent: And that in the Time of Alarm, the said Company shall be under the immediate Direction of the Commander in Chief of the Colony. 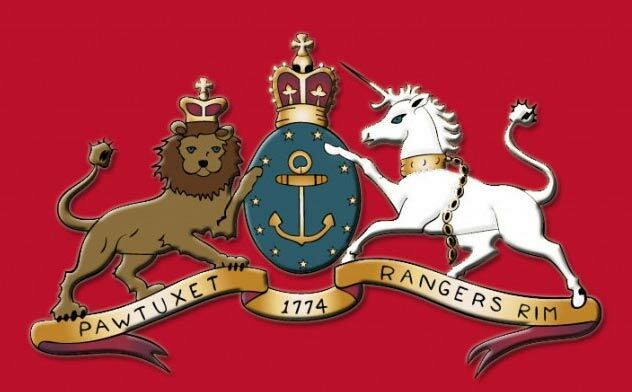 IT is Voted and Resolved, That the Secretary of this Colony be, and he is hereby, directed to make a fair Copy of the preceding Act, establishing the Company called the Pawtuxet Rangers, affix the Colony Seal thereto, and transmit the same to the said Company. Samuel Aborn, Captain Benjamin Arnold, First Lieutenant, Rhodes Arnold Second Lieutenant and Stephen Greene, Ensign. In 2013 the Pawtuxet Rangers discovered that a copy of our original charter was to be auctioned by the Skinner Auction House in Boston. Several people scurried around to formulate a plan to bring this important document back home to The Rangers Armory and Pawtuxet Village. The Rangers voted to supply the funds for bidding with the hope that the community would rally and help replace the purchase price as well as the cost of conserving the document so it could be displayed at its new home in the Armory. We won the bid and everyone celebrated at the Rangers Annual Christmas Party and Open House. The document is preserved and framed for display. There with a joyous celebration at its unveiling.